› Author AffiliationsM.P. acknowledges Università degli Studi di Milano for a pre-doctoral fellowship. M.B. thanks Università degli Studi di Milano for a H2020-Transition Grant. M.E.C. thanks Fondazione Cariplo for a postdoctoral grant. The enantioselective organocatalytic reduction of aryl-substituted nitroenamines was successfully performed under continuous-flow conditions. After a preliminary screening with a 10-μL microreactor, to establish the best reaction conditions, the reduction was scaled up in a 0.5-mL mesoreactor, without appreciable loss of enantioselectivity, that remained constantly higher than 90%. The in-flow nitro reduction was also accomplished, either by Raney nickel catalyzed hydrogenation or by a metal-free methodology based on the use of the very inexpensive and readily available reducing agent trichlorosilane. 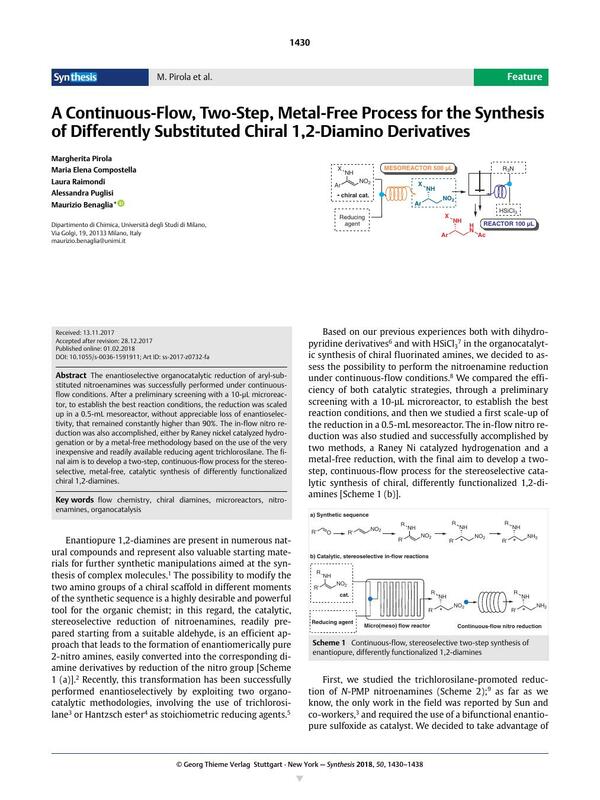 The final aim is to develop a two-step, continuous-flow process for the stereo­selective, metal-free, catalytic synthesis of differently functionalized chiral 1,2-diamines. Supporting information for this article is available online at https://doi.org/10.1055/s-0036-1591911. 9 For the detailed synthesis of nitroenamines, please see the Supporting Information. 11 Although different experimental conditions were investigated (flow rate, temperature, stoichiometry, solvents, use of additives like thiourea), the maximum yield was 33%; low conversion and the appearance of some side products due to starting material degradation were observed and were responsible for the disappointing results. 12 For a recent review on nitro reduction, see: Orlandi M. Brenna D. Harms R. Jost S. Benaglia M. Org. Process Res. Dev. 2016; DOI: DOI: 10.1021/acs.oprd.6b00205.